The Windham Campbell Prizes Literary Festival celebrates the work of the 2014 winners of the Donald Windham-Sandy M. Campbell Literature Prizes, annual awards that honor literary achievement and provide writers with the opportunity to focus on their work independent of financial concerns. The eight prizewinners will participate in a broad range of public events, such as master classes, talks, and master's teas. The festival kicks off Sept. 15 with a keynote by novelist Zadie Smith. 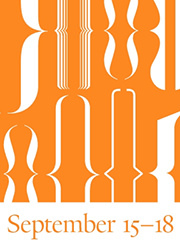 See the full schedule at: http://windhamcampbell.org/festival.